indicates Pin 2 tied to tip and MK3-P3 indicates Pin 3 tied to tip. 18.5' and 25' for both MK3 models. MK3-P2 indicates pin 2 of the XLR is tied to the tip of the 1/4" plug (pin2 hot). MK3-P3 indicates pin 3 of the XLR is tied to the tip of the 1/4" plug (pin3 hot). The remaining pins of the XLR are tied to the shield of the 1/4" plug. Stock lengths are 3', 10', 18.5' and 25' for both MK3 models. 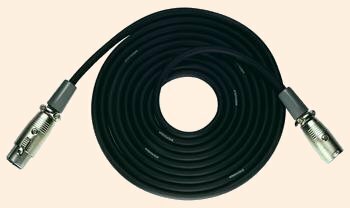 Whirlwind Quad cables feature WI3F and WI3M XLR connectors soldered to premium Canare star quad cable. A cross-section of the cable shows these four conductors arranged as two pairs in an "X" configuration. The result is a microphone cable that resists induced noise in the most severe environments. Available in black, red, blue, yellow, green and gray, and in 6', 10', 15', 20', 25', 30', 50' and 100'. lengths. The model number is formed by MKQ + cable length + color. For example: MKQ50-Blue. (Z) Series mic cables are high quality imports built to our specifications. They are your best choice when budgets are too tight for our MK or Quad cords. Available in 10' and 25'. lengths. The model number is formed by ZL + cable length. and 100'. lengths. The model number is formed by MKQ + cable length + color.